Fielding a European style product but with increasing focus on attracting North American guests, MSC Cruises is fast expanding with a plethora of razzle-dazzle new ships. One of the newest is MSC Orchestra. Come along for a snapshot look at the MSC Orchestra! 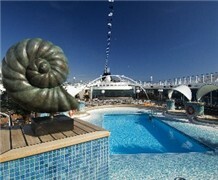 MSC Cruises is sporting a new livery with compass logo on its ships. The line has begun restyling the exteriors of several ships and plans to add the livery to all the fleet's ships. The compass logo was first incorporated by the line in 2004 -- and symbolizes the diversity of its horizons.